On occasion, I've written a bit about my childhood and since no one seems too horrified by that, I thought I'd again take a moment to reflect upon one of my favorite movies from childhood: Forbidden Planet. I consider myself fortunate to have gotten my hands on a copy of the 50th anniversary DVD release. Designed for nerdy fangirls like myself, this edition includes a making of documentary and a collection of replica lobby cards on top of buches of other cool features. If you've never seen the movie, I'm likely about to spoil it for you. That's your warning. Read on as you see fit. The 1950's were a complicated time for the film industry. Audiences were staying home to watch television and the major Hollywood production companies were forced to divest their theatre chains. This break down of the Hollywood monopolies forced studios to reduce production timelines and film budgets. This was actually a great time for scifi; do a little leg work and you'll turn up at least 150 movies made during that decade. A first blush this seems a bit absurd however, upon closer inspection, the overwhelming number of scifi movies produced at this time are not a bit surprising. Let's talk about US history for a moment here. Science and technology were booming in the '50's with inventions and advances happening seemingly overnight. There were many significant firsts and discoveries: organ transplant, bomb creation, color tv, Polio vaccine, DNA, the space race, Velcro, LEGOs, etc. And at the same time, socially and politically there was significant turmoil: Communism and the Korean War, segregation becomes illegal, Rosa Parks keeps her seat, quiz shows proven to be fixed, etc. With so many "unknowns" it's no wonder that our fiction from the time reflects a significant level of fear accompanied by a sense of curiosity and wonder. It's also no wonder that we chose space as one of primary focus for those fears, as we knew so little about space at the time. In the case of Forbidden Planet, things were a little different. They had a production budget of nearly $5 million (about 5 times the average budget of a feature film at the time.) 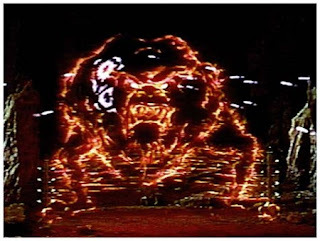 This meant that they were able to build intricate sets and props (including the spaceship, Robby the Robot, and the transport tractor), hire non-union musicians to create the score, and hire an animator from Walt Disney studios to create many of their effects. All of that said, the effects were the accomplishment of the movie, not the attraction. The effects were complementary to a complex and classic story. To scifi fans now, the surface story of Forbidden Planet is incredibly familiar to us; astronauts land on a strange planet, find lone survivors of a crash, and encounter strange creatures and occurrences. This is a story we've seen on Star Trek a hundred times. But, like most scifi, the underlying stories are significantly more substancial. Within Forbidden Planet can be found the three great narrative conflicts: Man VS Himself, Man VS Nature, and Man VS God. Because of these essential story elements, Forbidden Planet has been compared to many great works of fiction. 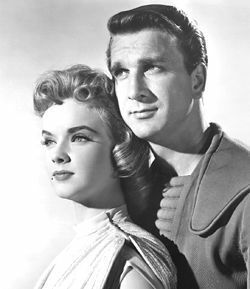 Most often, Forbidden Planet is likened to The Tempest in plot and characters. In The Tempest, a great sorcerer is stranded far from home with his young daughter. 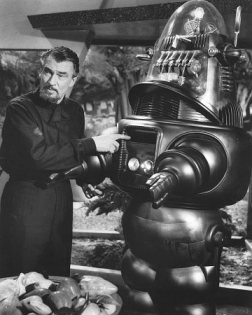 As is Morbius, played by Walter Pidgeon, stranded with his daughter Altaira, played by Anne Francis. He is a man alone and master of his domain. Events conspire to bring a ship of men into his world and his daughter falls in love with one of the men. In both tales, this daughterly betrayal brings about the destruction of the man's life. Forbidden Planet also borrows heavily from Frankenstein, particularly in the overt challenge the characters offer to god but also by subverting our concepts of "hero" and "monster", asking us to consider ourselves as the scariest monster of all. There is a very clear warning in each, "man should not attempt to play god," for if he does, he will be severely punished. We witness Morbius creating and taking life (as only god should) and suffering the greatest punishment possible, the loss of his loved ones followed by the loss of his own life. The last piece of dialogue spoken in the movie hammers this point home, "...your father's name will remind us...we are after all, not god." In both stories we are asked to consider our humanity: what makes us human? What separates us from animals? In both, the answer seems to be science. Humans have scientific minds. Morbius talks at length about how the Krell (the indigenous species on the planet) evolved past their animal (emotional) selves reaching a higher intellectual plane. And while Mobius believes he too has reached this higher plane, we see continuous posturing between him and the men of the landing party. He is the Alpha male, protecting his kingdom (at any length.) And to this end, the creature is a manifestation of his anger at being challenged. His highly scientific mind actually allows him to become an uncontrolled animal. When you look at these stories, the very Christian notin of the road to hell being paved with good intentions raises to the surface. Morbius may be seem an egomaniac who is tempting god's wrath but he acts out of love for his daughter. Best intentions lead to his destruction. There is another overarching concept in Forbidden Planet, one of facades and replication. Much of what we see on the planet's surface appears real enough but when put under the microscope, we realize it's a creation of Morbius' mind; real only on the surface. This idea is reflected in the direction of the movie. Many things are implied but never actually seen; we never see the Krell but Morbius suggests we can gather their appearance based on the architecture of their buildings. The creature the Morbius lets loose is invisible but we can gather it is very, very large. The audience is encouraged to let our imaginations run wild, which is the trap that Morbius fell into himself. 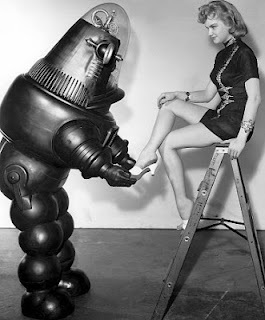 And possibly, due to my own inclinations, the above discussions have all looked at Forbidden Planet through the lens of tragedy which completely ignores the optimistic, love-story that is also central to the movie. Yep. That's all I've got on that subject. So. I think that brings us to wrap up time. I thought I might end with something a little different today. If this works out, maybe I'll continue it in future blogs. This trailer is wonderfully old fashioned; it's about 3.5 minutes long and is more like a pitch than a modern movie trailer. This 'pitch' sells the movie on the merit of it's pieces. The actors. The plot. The visuals. Each are featured and called out. 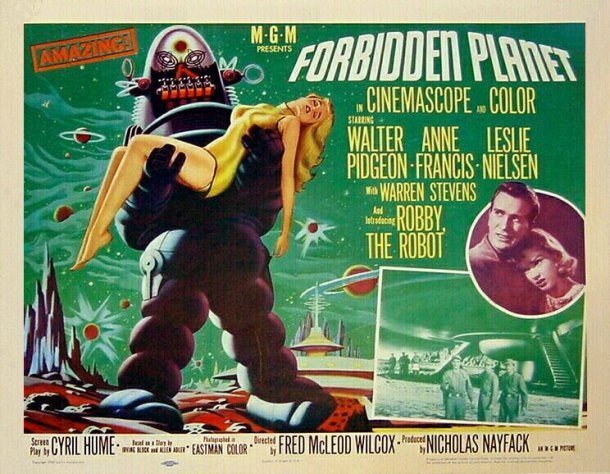 Created by a couple of avant garde hippies using cobbled together synthesizers and other odd musical instruments, there is still nothing quite like the score to Forbidden Planet. It's also interesting to note that at the time, it was unusual for an artist to create the soundtrack and the score to a movie. I'm glad that my sharing my favorite movie with you that it became your favorite. Morbius is so stuck on the front of his mind and the complete honesty and well meaning of his actions that he fails to comprehend that his own failings and insecurities become the monsters doing what he would NEVER do counciously. Man can become an animal at any time for it lirks below the surafce. Its why being a telepath would fry most peoples brains because contradictory and foul things lurk in a good pesons brain hidden, never supposed to see the light of day and balance our good and evil: yet exposed out of context disaster! FP was the first movie to make man himself the worst monster while man is trying to be god like: it fails to lesser beings to be unable to rid of the monster when its fed more thann the good and when being like god is actually an affront to ones beliefs.. Thanks for the pre birthday blog about Forbidden Planet! Everyone owes to Forbidden Planet and John Carter /Edgar Rice Burroughs.